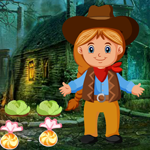 Games4King - G4K Little Cowgirl Escape 2 is another point and click escape game developed by Games 4 King. There was a fortress in the beautiful mystery surrounding a beautiful magnificent darkness. That fortress was beautiful. There is a cow girl living in that place. The little cow lady was trapped in a fort in a day unexpectedly. It is your duty to save the little cow girl from there. That little lady will help you find all the hidden clues in there to save the girl from there. Find all the clues and save that little girl from there and congratulate you to win the game. The tricks of the trick are a little harder to find, but somehow it may be a matter of interest. This game is highly desirable. Good luck and have a fun! This game is highly desirable. Wooden spoon is used on (rot 13)cvax rtt. Sword is used on (rot 13 ) gerr va evtug fprar. These colored dog heads are a pain!! If it helps I started with the left side. Thank you, G4K, for making hot spots shut off when we're done with them -- makes game play MUCH easier!